Saying Good-Bye to 2016 and Hello to 2017! What a year 2016 has been! I went through my blog and pulled out the top 9 recipes from 2016! I've hyperlinked them all below so you can get to them easily. Earl Grey Macarons - My Earl Grey Macaron Recipe Take 2! Dan's Ramen Recipe - Version 8 - Yup, this is one of Dan's real passions in life! Now, before we look at Food Resolutions for 2017 let's look back at my Food Resolutions for 2016. One of my resolutions was to bake from the Duchess Cookbook. I feel I took a good shot at it (as my instagram pictures and a few blog posts will show you), though there is certainly more recipes to try out for 2017. Another one of my resolutions was to learn to bake bread. Though I did start to learn (we even had a starter named Stanley), much of my learning to bake bread had to take a back burner for the time being as I found out in the middle of 2016 that I actually have a gluten sensitivity. So, while I will still bake and create recipes with gluten in it (especially when trying new cookbook recipes) we have started to experiment more with gluten free flours and alternatives to flour in our cooking and baking. 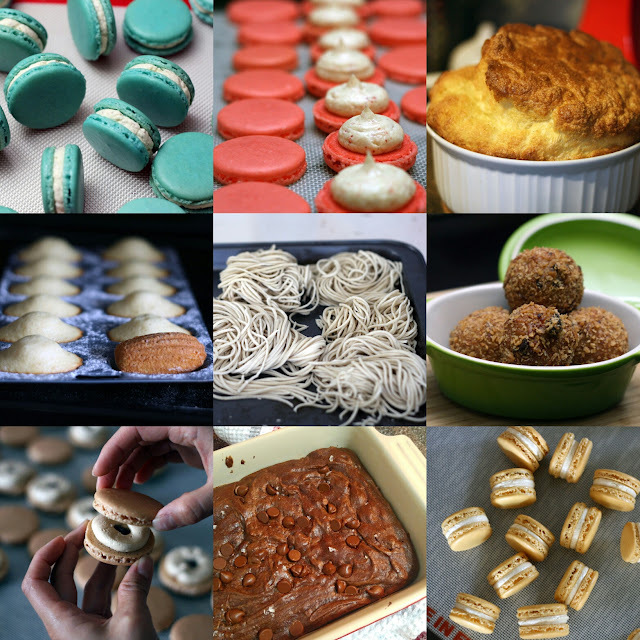 However, the good news is that macarons are most certainly gluten free (as they are made with almond flour), and as such I will continue to be creating, baking and blogging about macarons in 2017. Sadly, Dan and I have not yet had the opportunity to create any of the recipes from our French Laundry Cookbook. It turns out that making even something as small as an appetizer from the French Laundry Cookbook takes more planning and can't be done spontaneously; which is sort of how we go about with cooking in our household. Cooking from the French Laundry Cookbook will continue to remain one of our Food Resolution for 2017. Dan will also continue to try to do a post every so often - depending on how much time he has. He still wants to blog about his milk bread recipe and a lot about his oven roasting meat and methods! Dan and I also got an Instant Pot during the Black Friday sales in November. While Dan has always loved his old pressure cooker we have not fully explored the world of slow-cooking. We hope to blog some slow cooker or pressure cooker meals during 2017. Do you have any food resolutions for 2017? To me, food resolutions are food goals but more particular because they are goals that encourage you to explore creating different types of food. Perhaps even food that you may have dabbled in already but not fully! Was there anything you always wanted to know how to make? Share in the comments below!